Come in and check out our large selection of boulders. 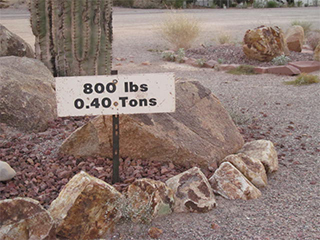 SURFACE SELECT: This type of boulder is shipped in from the Wikieup area and are the preferred type of boulder used in the install of a water feature. WE NO LONGER CARRY THE “SURFACE SELECT” BOULDERS. 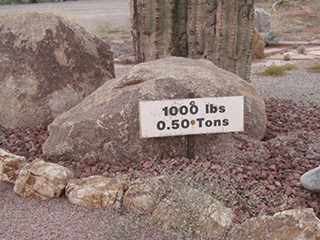 These boulders are part of our display to help give you see the weight of a boulder relative to the size of a boulder. 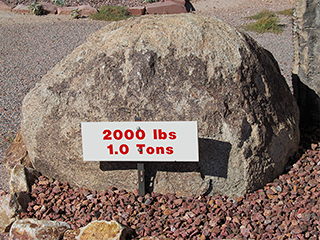 A 2’x2’x2′ (or 2foot x 2foot x 2foot) boulder of any type will weigh about 800 pounds. 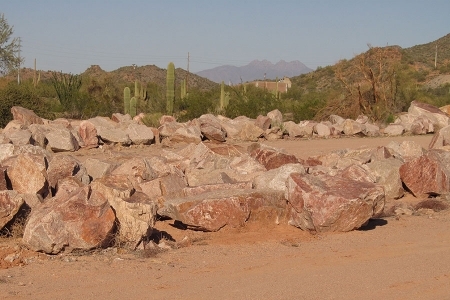 These boulders are from our Red Mountain Site and are available year round. These boulders are found right here in our pit. These boulders range anywhere from very small to very large in size and shape and are either Pink coral or Desert Gold in their color. These are in limited supply and will not be restocked once they are gone. We still have a various selection of boulder colors that have been discontinued. Because these colors are not being produced any longer, these boulders will not be restocked and are available on a first come first served basis. PLEASE NOTE: We require the customer to come in and mark each boulder they desire to purchase. Ask the sales staff for the marking tape. You will be directed to the “Boulder Patch” where you can personally choose your boulder, mark it and then return to the Sales Office with a list containing the number and type of marking you chose. BOULDERS WILL NOT BE LOADED AFTER 2:00 PM. NO EXCEPTIONS.